A few years ago, somewhere in June, me and husband planned a short trip to Ganpati Phule. 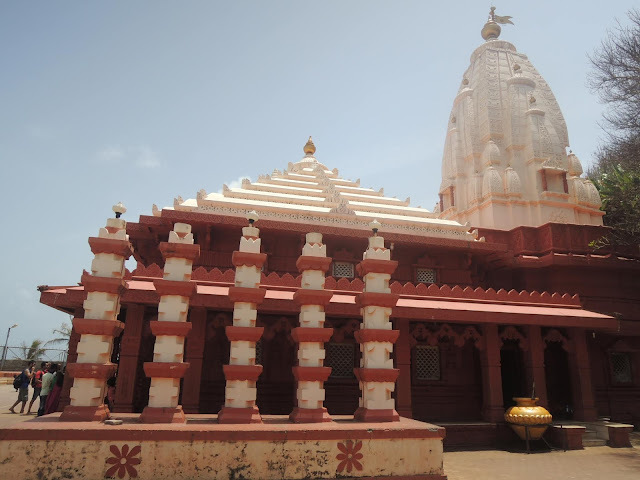 For those who aren't aware, Ganpatipule is a small town located in the Ratnagiri district on the Konkan coast of Maharashtra in the sub-continent of India and is about 375 km away from Mumbai. The purpose of this trip was relaxation and not sight seeing. But when we reached here, we had too much fun. So I decided to pen this post in order to give you a gist of things you should do if you ever visit Ganpati Phule. Ganpati Phule is famous for the beautiful Ganpati Temple which stands facing the ocean. The Ganpati idol in the temple is 400 years old and is Swayambhu meaning self originated. Unlike most deities in Indian temples, this idol faces the west instead of the east, and is believed to safeguard the western gates. When my parents had visited this place a decade ago, they were mesmerized by its beauty. But when I visited it last year, I was a little disappointed. The temple was beautiful and very well maintained, but the beach was in a sorry state thanks to thousands of irresponsible tourists. Around 2-3 kms away from Ganpati Phule Beach is the Aarey Warey Beach. And I am so glad, we explored it. It reminded us of the beaches in California. Isolated, clean and beautiful. Husband and I spent 3 hours just walking on the sand, splashing water and watching the sunset on the horizon. It was the most surreal experience ever. Around 35 kms away from Ganpati Phule is the Jaigad Fort, which was built around 14th Century and has a very interesting history. Though it is mostly ruins, this fort still has some stairs that take you over elevated platforms and give you breathtaking views of the Arabian Sea and Shastri river. Since we had visited it around monsoon, everything around was lush and green. And I also convinced husband to take some outfit pics for my blog. Win-Win I say! Also, the drive from Ganpati Phule to Jaigad Fort is very scenic, so keep your cameras ready. This is a national museum and if you are interested in studying the history and culture of Konkan, this is a must visit. The entry fee is Rs. 30 per person, and Rs. 20 if you want to take pictures inside. We went here with zero expectation but had too much fun. Right from the story of how Konkan came into existence, to the lifestyle of people leaving in Konkan, the wild life in Konkan and the sealife of Konkan; this museum had it all covered. The guides in this museum are school students who work here part time. I was impressed by their knowledge and zest for life. The place also has a Shell museum where you get to see some really rare and beautiful varieties of shells. At the end of the tour, they have a souvenir shop, where you can buy jewellery, accessories and toys made from wood and shells. This spot wasn't recommended on any travel site, but we stumbled upon it on our way to Jaigad fort. It looked so beautiful, that on our way back we stopped here. This is a beautiful Ganesh temple built by the Birla Group of Industries who have factories and staff quarters near Ganpati Phule. This restaurant is very close to the Ganpati Phule Beach. It is an MTDC restaurant and is a part of the MTDC resort of Ganpati Phule. I am not a fan of MTDC restaurants, but I think this is the best one I have visited. Their Punjabi cuisine as well as Malvani cuisine were perfect and reasonably priced. I recommend that you try their Paneer Kadhai and Kaju Malvani. Both the dishes were so flavorful and good, that we went to this place for at least one meal a day during our stay in Ganpati Phule. Have you guys been to Ganpati Phule? What did you like more? Wow, it really looks like a hidden gem! Thanks for sharing these all wonderful memories of ganpat. These all images also looking so beautiful that you have shared with us. Gezz! Love it,Thanks for your recommendation, will definitely visit this place next time. I totally love your blog. Worth reading! Such a wonderful trip you have shared. This blog is very Awesome and mind-blowing. thanks for sharing this attractive pictures and this blog. Thanks a lot for sharing your travels with us! It is very travel post and also attractive images. I need this! Summer vacation for relaxation. Thank you for sharing this. Thank you for sharing. It is looking very peaceful and relaxation.